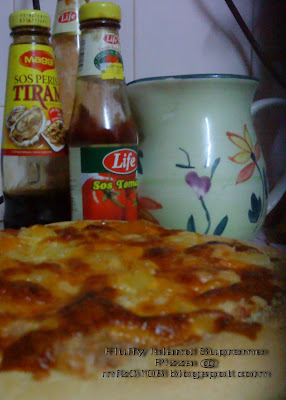 Last night I made this pizza, the recipe i godek2 from Cik Mat Gebu's Kitchen..he named it Pizza Gebu.. I'm satisfied with this pizza, very fluffy ...yet delicious too..Anyone who're interested to try . 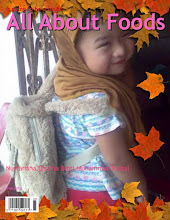 I guaranty you are not going to be disappointed.. let have the recipe ok! For the dough just put all the ingredient in the bread maker and press no 10. Wait until it done..after about 1.5 hour take out from BM and start tu make it into round leper shape. Place it in the pizza pan and bake for 5 minute at tempreture of 200 degrees celcious. After that put sos tomato all over it surface...then followed by tuna spread, cubed pineapple and crabmeat stick, sos of thousand island and lastly the cheese. 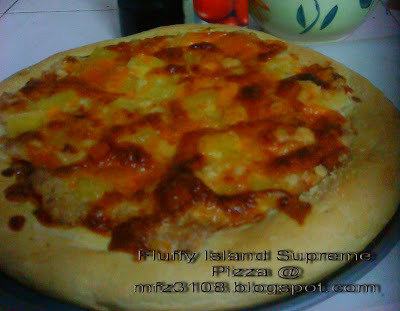 I'm using 3 kind of cheese cheddar, parmessan and mozzarella. Bake it again at 175 degrees for about 25 minutes ...here there are..it done.....mmmmmm.....try it!